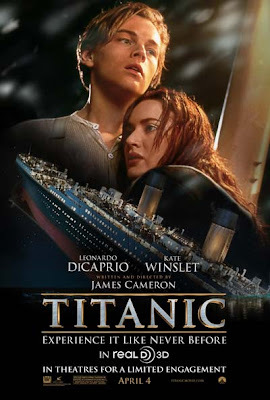 Editor James A. Molnar reviews "Titanic 3-D," in theaters April 4, 2012. "But nevertheless I was taken away by the movie, enchanted once again, the music and love theme ever more powerful." There is a moment during "Titanic 3-D" when the audience realizes just what they are in for. The innocent love story has come to an end and it's now time for something more serious: the tragedy. Just like Kathy Bates' "new money" character Molly Brown observed on the boat, the survivors are in for a harrowing evening, with sights and sounds of more than 1,500 people dying under the black sky blanketed with stars. And there is nothing she can do to help. We all may know the ending, but we still root for Rose and Jack (young Kate Winslet and Leonardo DiCaprio). You want the ending to be different, the ship not to sink. It breaks your heart. As I sat in the theater chair, it was almost like watching the tragic morning of April 15, 1912, from a lifeboat. Almost — the chair was cozy, the theater warm and I was snacking on popcorn and a frozen Icee. The story unfolds in front of our eyes. As the movie continues, it's not easy to understand quite what those on board experienced. After first watching the original film in theaters 15 years ago, at 10 years old, I don't remember a lot of specifics but more general themes. The unhappy betrothed, greed, the sunken ship, the exquisite detail and visual effects in the movie, the enchanting score, the diamond and the drawing scene were all remembered. Of course, there was the fear of being in a boat or ship that resonated with me for years. As an adult, I watched the film with a slightly different filter. But nevertheless I was taken away by the movie, enchanted once again, the music and love theme ever more powerful. The visual effects are still stunning and timeless. The 3-D is a new element to the film. It's well done and adds depth to the picture. But it's not why I wanted to see the Academy Award-winning film again. There's nothing quite like seeing a classic film on the big screen. And now I can actually remember the film better and relate to some of its themes. The three-hour-14-minute film flies by. And it still holds true that the reason the James Cameron-directed movie shines is because it's a great story, not because it's a documentary about a ship. Everyone knows that story. So too with the 3-D. It's not the reason to see the movie, but like icing on the cake.